Nassau County District Attorney Madeline Singas and Assistant Special Agent in charge of Homeland Security Investigations, New York, Jason Molina (3rd L), at a press conference to announce the 85-count indictment of 41 alleged MS-13 gang members in Nassau County, Long Island, N.Y., on June 15, 2017. MINEOLA, N.Y.—The arrest of 41 alleged MS-13 gang members in Nassau County last week highlighted a gaping hole in the immigration system. 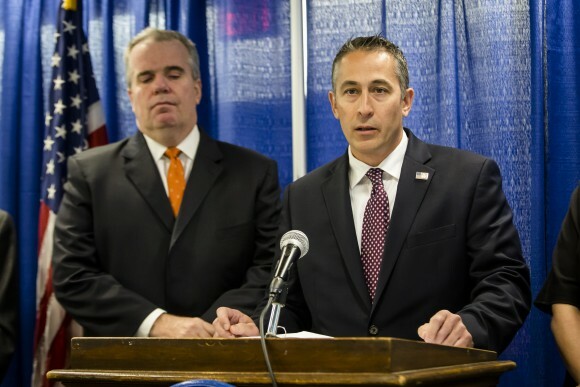 Of the 41 individuals in the 85-count indictment, 19 came into the country as unaccompanied minors (a child under 18 who illegally crosses the border without a parent or guardian), according to Nassau County Police Commissioner Thomas Krumpter. He said that of the 22 others arrested, one is a citizen, while the rest are in the country illegally. “The operation has laid bare the critical need to carefully examine how we are handling unaccompanied minors as they come into this country, because it’s clear that current policies leave a vacuum that can turn into a recruiting pipeline for violent gangs,” said Nassau County District Attorney Madeline Singas on June 15. MS-13, or Mara Salvatrucha, was formed in Los Angeles by Salvadoran refugees in the 1980s, and has since proliferated in El Salvador. With the influx of unaccompanied minors from Central America crossing the southwest border and seeking asylum, violence has been escalating on Long Island. 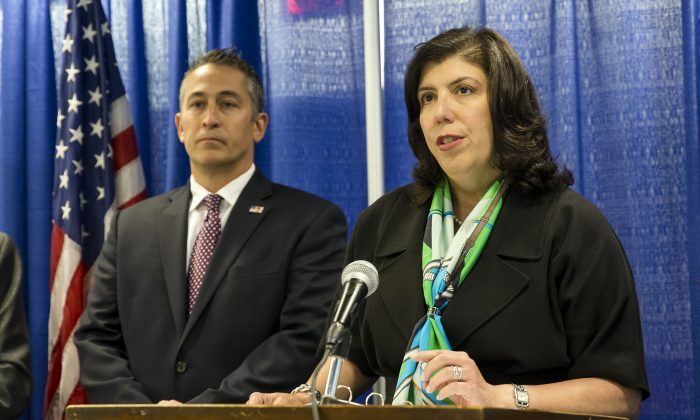 “In this indictment, we allege that these defendants are responsible for 32 violent acts in Nassau County including eight attempted murders and other shootings, slashings, and stabbings,” Singas said. When an unaccompanied minor crosses the border, he or she is transferred to the Office of Refugee and Resettlement (ORR). The ORR then sends the minor to a sponsor, who is usually a family member or friend of the family. The Department of Homeland Security said in a February memo that at least 60 percent of minors classified as “unaccompanied alien children” are not eligible for the status or the benefits it affords (including health care and social services) because they are entering the country to live with one or more parents illegally residing in the United States. Nassau County has absorbed 3,808 unaccompanied minors into its communities and schools since the beginning of fiscal year 2014, the eighth-largest amount in the country. Neighboring Suffolk County has taken in 4,639, the third-largest number. Following a spate of murders in Suffolk County, Attorney General Jeff Sessions visited Long Island in April to highlight the Justice Department’s commitment to eradicating the gang. 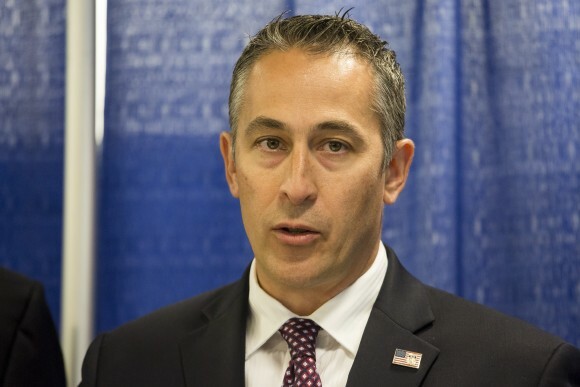 Jason Molina, assistant special agent in charge of Homeland Security Investigations in New York, said the agency is looking into the “illicit pathways” that unaccompanied minors and other individuals exploit to come into the United States. Singas said MS-13 leadership in El Salvador has implemented what they call the “New York Program,” which mandates an increase in violence and bloodshed in New York. In a separate operation over the last month, 39 alleged members of MS-13 have been arrested on Long Island—mostly from Nassau and Suffolk counties. The current indictment stemmed from a concerted effort since December to reopen cases, find witnesses, and gather information on MS-13 activity and membership in Nassau County. “Their motive here on Long Island is not profit, but terror,” Singas said. She said MS-13 is aggressively recruiting in high schools in the towns of Hempstead and Uniondale, but the gang also targets children as young as 8 or 9. Those arrested are aged between 15 and 30. 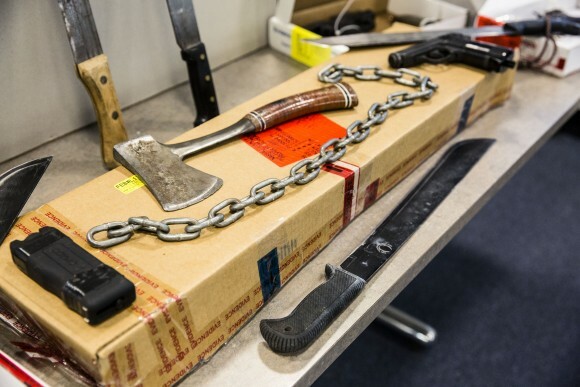 “Often they surround a vulnerable child, ask him or her which gang they belong to, and while displaying machetes or guns, or other weapons, they demand that they join their gang or else they’ll suffer violence, or their families will,” Singas said. Aspiring MS-13 gang members must submit to a brutal beating, during which each established member beats the new member for at least 13 seconds, before they can join. Thirty-five of the 41 defendants face up to 25 years to life in prison if convicted of the top count, according to the indictment. The charges are amplified by using the charge of conspiracy. “Our theory is that MS-13 is formed with the goal to inflict terror, acts of terror including up to murder, and all of these individual acts are committed in furtherance of that conspiracy, of the existence of that gang,” Singas said. Krumpter said the police department has identified 712 MS-13 members in the county, of which it considers 345 to be active members of MS-13. He said two additional gang members were arrested on June 15. Both had been previously deported and will be charged with re-entering the country.